Extending Kaleidoscope to support if/then/else is quite straightforward. It basically requires adding lexer support for this “new” concept to the lexer, parser, AST, and LLVM code emitter. This example is nice, because it shows how easy it is to “grow” a language over time, incrementally extending it as new ideas are discovered. Now that we know what we “want”, lets break this down into its constituent pieces. The AST variant just has pointers to the various subexpressions. Another way to get this is to call “Llvm_analysis.view_function_cfg f” or “Llvm_analysis.view_function_cfg_only f” (where f is a “Function”) either by inserting actual calls into the code and recompiling or by calling these in the debugger. LLVM has many nice features for visualizing various graphs. In Chapter 7 of this tutorial (“mutable variables”), we’ll talk about #1 in depth. For now, just believe me that you don’t need SSA construction to handle this case. For #2, you have the choice of using the techniques that we will describe for #1, or you can insert Phi nodes directly, if convenient. In this case, it is really really easy to generate the Phi node, so we choose to do it directly. Okay, enough of the motivation and overview, lets generate code! As opposed to the C++ tutorial, we have to build our basic blocks bottom up since we can’t have dangling BasicBlocks. We start off by saving a pointer to the first block (which might not be the entry block), which we’ll need to build a conditional branch later. We do this by asking the builder for the current BasicBlock. The fourth line gets the current Function object that is being built. It gets this by the start_bb for its “parent” (the function it is currently embedded into). Once it has that, it creates one block. It is automatically appended into the function’s list of blocks. Once the insertion point is set, we recursively codegen the “then” expression from the AST. The final line here is quite subtle, but is very important. The basic issue is that when we create the Phi node in the merge block, we need to set up the block/value pairs that indicate how the Phi will work. 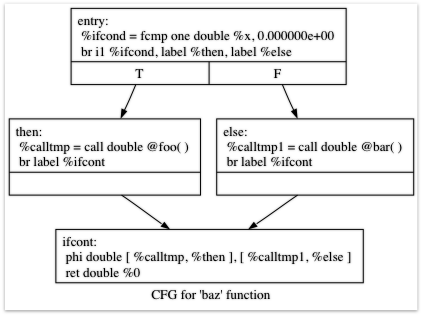 Importantly, the Phi node expects to have an entry for each predecessor of the block in the CFG. Why then, are we getting the current block when we just set it to ThenBB 5 lines above? The problem is that the “Then” expression may actually itself change the block that the Builder is emitting into if, for example, it contains a nested “if/then/else” expression. Because calling Codegen recursively could arbitrarily change the notion of the current block, we are required to get an up-to-date value for code that will set up the Phi node. Code generation for the ‘else’ block is basically identical to codegen for the ‘then’ block. The first two lines here are now familiar: the first adds the “merge” block to the Function object. The second changes the insertion point so that newly created code will go into the “merge” block. Once that is done, we need to create the PHI node and set up the block/value pairs for the PHI. Once the blocks are created, we can emit the conditional branch that chooses between them. Note that creating new blocks does not implicitly affect the IRBuilder, so it is still inserting into the block that the condition went into. This is why we needed to save the “start” block. To finish off the blocks, we create an unconditional branch to the merge block. One interesting (and very important) aspect of the LLVM IR is that it requires all basic blocks to be “terminated” with a control flow instruction such as return or branch. This means that all control flow, including fall throughs must be made explicit in the LLVM IR. If you violate this rule, the verifier will emit an error. As before, lets talk about the changes that we need to Kaleidoscope to support this. The AST variant is just as simple. It basically boils down to capturing the variable name and the constituent expressions in the node. This loop contains all the same constructs we saw before: a phi node, several expressions, and some basic blocks. Lets see how this fits together. Now the code starts to get more interesting. Our ‘for’ loop introduces a new variable to the symbol table. This means that our symbol table can now contain either function arguments or loop variables. To handle this, before we codegen the body of the loop, we add the loop variable as the current value for its name. Note that it is possible that there is a variable of the same name in the outer scope. It would be easy to make this an error (emit an error and return null if there is already an entry for VarName) but we choose to allow shadowing of variables. In order to handle this correctly, we remember the Value that we are potentially shadowing in old_val (which will be None if there is no shadowed variable). Now that the body is emitted, we compute the next value of the iteration variable by adding the step value, or 1.0 if it isn’t present. ‘next_var’ will be the value of the loop variable on the next iteration of the loop. The final code handles various cleanups: now that we have the “next_var” value, we can add the incoming value to the loop PHI node. After that, we remove the loop variable from the symbol table, so that it isn’t in scope after the for loop. Finally, code generation of the for loop always returns 0.0, so that is what we return from Codegen.codegen_expr. let the_module = create_module context "my cool jit"
(* Install standard binary operators.